Jacques Cousteau once said, “What is a scientist after all? It is a curious man looking through a keyhole, the keyhole of nature, trying to know what’s going on.” The scientists working at the Laser Interferometer Gravitational-Wave Observatory (LIGO) have a similar attitude when it comes to the quest for gravitational waves. This unusual theoretical phenomenon was originally predicted by Einstein in the same 1916 paper that gave us Einstein’s theory of general relativity. Currently, gravitational waves are the only untainted mechanism we can use to study the moment of the Big Bang and the inflationary period of our universe. 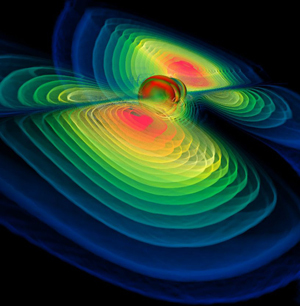 A gravitational wave is a ripple in the fabric of spacetime. They are hypothetically created by large gravitational disturbances, kind of like waves in a pond; a better analogy might be to compare them to electromagnetic waves. 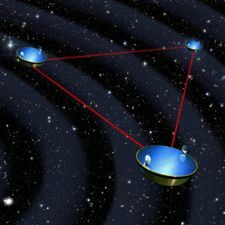 Gravitational waves, though weaker than its electromagnetic counterpart, have the advantage that they can pass through other matter without being significantly affected. Because of this, gravitational waves may help us to answer questions about the basic construction of the universe. What’s the catch? We haven’t detected any yet. Whereas indirect evidence of their existence has been observed, we haven’t definitively proven they exist. 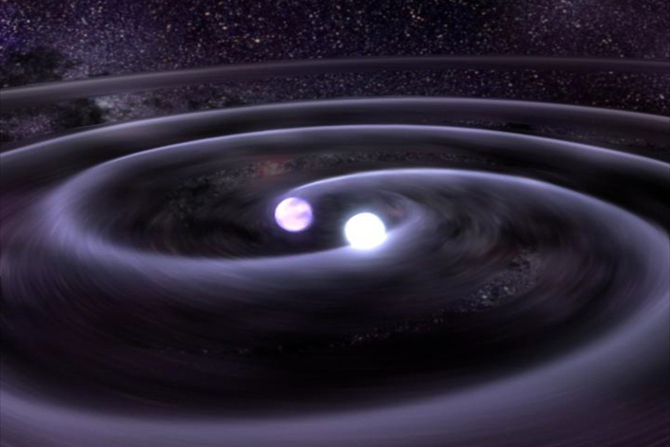 (Though it would seem as if that were no longer the case [EDIT: Latest research calls into question previous findings of gravity waves. Please see this article.) Even then, because of the lack of gravitational waves, scientists are able to rule out several different inflationary models describing the earliest moments of our universe. Because these waves distort spacetime, scientists hunt for them using the lasers at the LIGO facility. A laser is split into an L shape and travels down two separate 4-km arms where it bounces back and is then is measured to detect any differences. (See the graphic to the left for a visual of the process) As a gravity wave passes through, one arm would get longer as the other gets shorter. Scientists are now installing a more sensitive detector called the Advanced LIGO (scheduled to be fully operational in 2014). Advanced LIGO will be about 10 times more sensitive than LIGO and scientists hope this will provide us with more answers and perhaps discover these elusive waves. Of course, the discovery of gravitational waves would have far-reaching ramifications in the world of physics. As an example, in the case of two orbiting black holes, we’ll be able to know everything from their masses to their locations in the universe – all from the gravitational wave. Plus, such a discovery would prove yet another peculiar aspect of our universe predicted by Einstein with his equations in relativity. The Periodic Table in Flux: How was the Periodic Table Born?